Front Page > Swindon Life > It Was 50 Years Ago Today! It was half a century ago when the Beatles produced what is arguably their greatest work - Sgt. Pepper's Lonely Hearts Club Band. When it was finally released on 01 June 1967 to worldwide acclaim, it was the culmination of five months hard work that many say was the height of the band's song writing & collaborative powers. After which, the relationship between Lennon & McCartney would never be quite the same again. 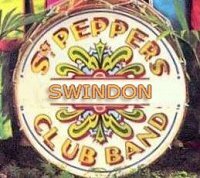 It was also a seminal, groundbreaking 60s album with more than one major connection to Swindon. Both musically and graphically. You could almost say, they couldn't have done it without us. Well sort, of! The cover of the Sgt. Peppers album is equally as memorable as the music. The colourful collage of life-sized cardboard models of famous people put together by Peter Blake, an iconic piece of art that for many summed up the 1960s and the '67 'Summer of Love'. 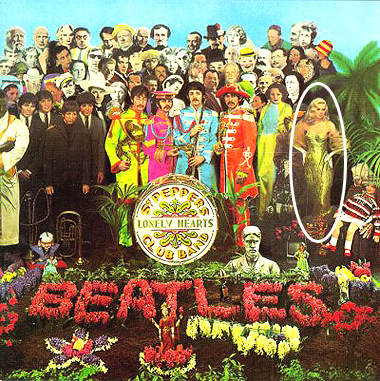 And in pride of place in the front row next to John, Paul, Ringo and George was Swindon's own - Diana Dors. Our most famous actress chosen personally by the group as one of the key personalities and heroes that had most influence on their lives, especially when they were growing up. Her distinctive face and blonde locks - in a gold dress and white gloves - appearing amongst 73 other historical figures from around the world including Oscar Wilde, James Dean, Karl Marx, Bob Dylan, Shirley Temple and Marlon Brando to name but a few. Her appearance all the more significant when you consider the likes of Elvis Presley, Mahatma Gandhi and even Jesus Christ himself weren't included. Ms. Fluck (to use her real name when she was born in Swindon in 1931) most pleased apparently to feature more prominently than the woman she was often compared with - Marilyn Monroe, whose head appears in the centre, second row. Our strongest connection to Sgt. Peppers and the Fab Four has to be the man they call the 'Fifth Beatle'. 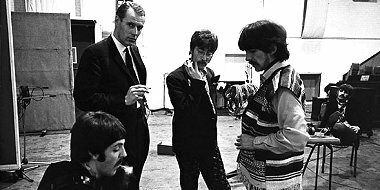 A familiar face in Swindon for nearly fifty years, and the person the band trusted to produce and mix the album in EMI's Abbey Road Studios - George Martin. "It was an amazing period to be involved in," said Sir George, who, up until his death in March 2016, could often be seen shopping in Highworth, just three miles from his home in Coleshill, where he had lived since 1964. "Each song and its contents was innovative in every sense. And you could tell at the time it was going to be something special." Sir George's experience and influence far more reaching than just advising on instrumental arrangement and recording techniques. His notable contribution on Sgt. Pepper being the orchestral finale for 'A Day In The Life'; the piano playing on 'Lovely Rita' and the 'circus' sounds for 'Being For The Benefit Of Mr Kite'. In 1978, his connection to the album went even further when he was asked to produce the soundtrack for the Bee Gees’ film 'Sgt Pepper’s Lonely Hearts Club Band'. A musical tribute to Lennon and McCartney's original work that Martin described as a 'thoughtful interpretation'. In 2006, alongside his son, Giles, he re-mixed the Beatles 'Love' album to critical acclaim - the first time a third party has ever been given permission to alter a Beatles recording in such a way.